A post in which I offer up that rare and elusive thing: a book review. If you don’t like books with terror and blood and gore and violence and dark irreverent humour and taut seamless writing, this book is not for you. Honestly? It’s not for me either. This will not come as a surprise revelation to regular readers of this blog. I don’t usually read horror fiction. I don’t enjoy being terrorized. I’ve raised two kids to quasi-adulthood — I don’t need more fear in my life or another reason to lie awake in bed at night, worrying. But when Konrath(Kilborn) said he and three of his writer friends had written a book about vampires, who are usually amusing or sparkly or just plain ridiculous rather than scary — um, vampires that is, not his writer friends — I thought, hey, how bad could it be? I seriously underestimated these guys. Turns out they’re all talented writers and the cover copy is a listing of last names and not a cryptic directive to Kilborn about how to survive the vampire apocalypse. Who knew. One of the reasons I don’t read horror is that my slightly warped writer’s imagination tends to take up where the book leaves off. And then I have nightmares. Well, let me tell you, there’s no worry of that happening here because this book never leaves off. 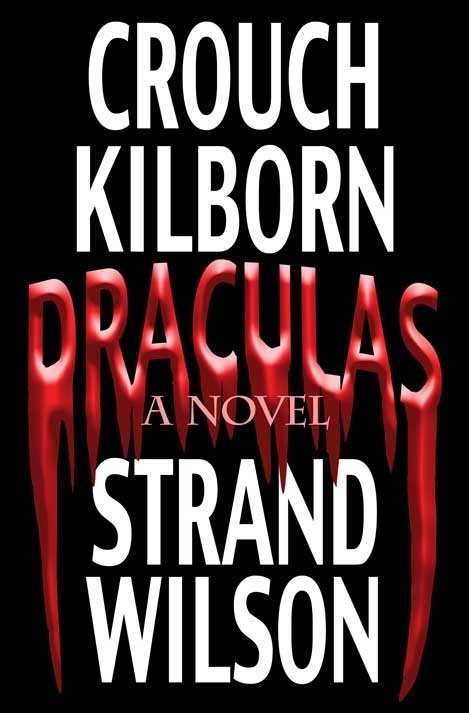 Others have summarized the plot elsewhere so I won’t do that, but I will say that the resurrection of an ancient skull with the still-potent power to create “draculas” however many centuries later is a unique and brilliant premise. The resultant frenetic replication of the “vampire virus” feels a bit like being caught up in a psychedelic blood-drenched petri dish run amok, but then I suspect horror fiction tends to be like that. Even so, I was delighted by the brief flashes of humour. I wasn’t expecting that in a horror novel. I’m not familiar enough with it to be sure, but even much of the over-the-top gore felt like a tongue in cheek (or what was left of those body parts) tribute to the genre. Mortimer rolled on top of her, like a lover, blood and saliva dripping onto Jenny’s face and neck. She reached up to push him away, but as terror-stricken as she was, Jenny couldn’t bring herself to touch him. Quite a touching scene. Without actually, you know, touching. And then there were the balloon animals. So wrong. So horribly hilariously wrong. And that whole kangaroo thing. Words fail me. The use of multiple point-of-view characters should have made this a confusing read. Instead, it serves to increase the tension, making you worry about which of them will survive. You’ll be surprised by who doesn’t. And who does. I’m conflicted about how many stars to give this book. I don’t enjoy horror and so I can’t say I “liked” it. But I do appreciate a well-written book that does exactly what it’s supposed to do, even if I plan to never read another horror novel, ever again. DRACULAS delivers on its promise. I’m giving it five rather bloody stars. And I’ll be sleeping with the lights on for a while. Once it releases on October 19, you can buy DRACULAS here. It’s only $2.99 and hey, what’s a few nights lost sleep. I'm a writer of fiction. If you were looking for BCB Blog, you have found its new home. Yes, I will answer if you call me "BCB." It's a long story. Don't ask, just enjoy. Copyright © 2006-2019 KD James.